I love my 2002 HD Road King Classic, it handles really well. And fits me perfectly, I am 5 foot 9, and the floor boards make long distance riding comfortable. I added wider levers, as my fingers were too short to reach comfortably, and had an easy clutch installed for ease in shifting. 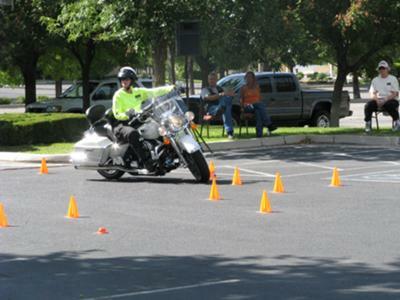 I was not as confident on it at first, so I take a Top Gun class, that teaches the same skills that motorcycle officers use everyday to safe their lives. Now I can turn my bike around anywhere and don't fear the mountains, I respect the turns in the mountains, I don't fear the turns. Now I am a Civilian Top Gun Precision Rider, my boyfriend and I perform at bike rallies and events. We demonstrate maneuvers all bikers should know and don't. To book a performance email ctgprecisionriders@hotmail.com or contact Colleen Boyle at www.t3rg.com. How long did it take you to conquer that dang "box"? The figure-8 in a 12X24 space had me dropping my bike twice! That is awesome! I hope to see you at a rally soon.